The spectacular architectural ensemble of the new German Chancellery was designed by Berlin-based architects Axel Schultes und Charlotte Frank during the time (1982-1998) when Chancellor Helmut Kohl was in office. 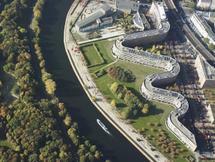 It is one of the most impressive structures in the newly created government district. The glass façades of the German Chancellery, more than anything else, give off the impression of transparency: twelve-meter soft steals, which at first glance look like columns, give structure to the glass façades, thus creating perspectives in which the inner and outer part of the building merge with each other. 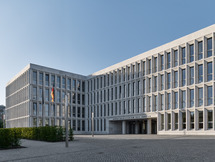 Inside the wings of the German Chancellery are located the offices of employees while the executive building is more for prestigious purposes. The entrance hall has the dimensions of a cathedral. The reception level of the Chancellor with its transparent design and balconies offers a wonderful view of the Tiergarten. In the courtyard of honor, where guests of the state are received, the monumental iron sculpture "Berlin" by Spanish artist Eduardo Chillida has been erected. Every September an "open day" is held when the headquarters of those in power can be seen.